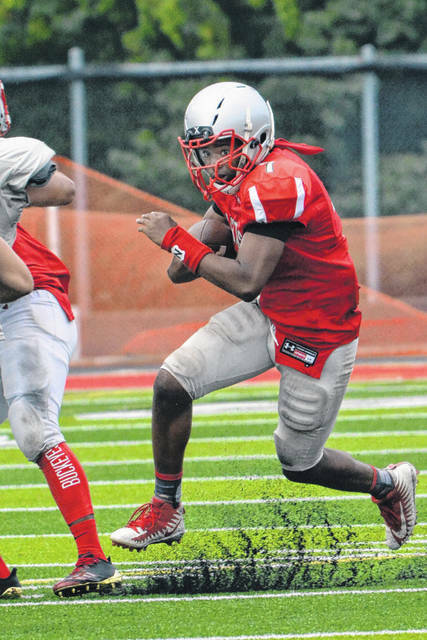 Lima Senior’s back Jawan Anderson will be one of three featured backs this year for the Spartans. PLAYERS TO WATCH: Jaleel King. Most underrated wide receiver in the league. SEASON OUTLOOK: Our players worked extremely hard during the off season. If we keep working hard we will surprise. Aug. 24 Northmont 7 p.m.
Aug. 31 at Piqua 7 p.m.
Sept. 7 COF Academy 7 p.m.
Sept. 14 Toledo CC 7 p.m.
Sept. 21 at Whitmer 7 p.m.
Sept. 28 at Fremont Ross 7 p.m.
Oct. 5 at St. Francis DeSales 7 p.m.
Oct. 12 Findlay 7 p.m.
Oct. 19 at St. John’s Jesuit 7 p.m.
Oct. 26 Oregon Clay 7 p.m.
LIMA — As Andre Griffin enters his third year as the Lima Senior head coach, the one thing he has learned is preparation in all aspects of the game is essential to winning on the football field. Coming into this season, Griffin said his staff and the players have had one of their better off seasons in terms of getting ready for the season as the Spartans look to reverse the trend of last season where Lima Senior finished 4-6 overall. Griffin said the players have become more accustomed to his hard nose approach to the game and he wants to make consistent winning a part of the culture in the Spartan football program. Griffin said he was impressed with the way the core players came back and worked hard since December and the majority showed up for camps, seven-on-seven and strength and conditioning. “The did everything they were supposed to do and they just have to take it to the field,” Griffin said. But it was not only the players that were working hard during summer. Griffin has brought in new coaches to the staff and one of the major changes is bringing in Chris Hawkins as offensive coordinator. Hawkins is a former head coach at Ontario, Galion, Wynford and Willard and has been successful in all of his stops. He also coached former Cleveland Browns quarterback Charlie Frye when he was at Willard. Griffin said with the loss of Keaton Upshaw and having no true tight end on the roster means the Spartans will feature a more true spread offense this season. Hawkins inherits an offense that will have a new quarterback and several new faces in the backfield and at the wide receiver positions. Jaleel King, an all-league and northwest district performer, headlines a core of talented skilled players. Joining King this year is Lima Central Catholic transfer Brayden O’Dell and several other players battling for playing time. “We have a lot of playmakers on our team and our things it is our linemen and not just our offensive linemen. We don’t have those big guys like they used to have here and we have to spread it out a little bit,” Griffin said. With four of the five returners back on the offensive line, Griffin said that they need to create some depth in case of injuries and keeping players fresh. Rashad Wallace will take over the signal caller duties. Behind him Griffin said he feels he has a trio of talented backs, possibly four, who can contribute to the running game. The three vying for playing time will be juniors Jawan Anderson and Zavion Brown and sophomore Mizhir McMillen. “I think we will be able to run the ball really well and run the ball with the quarterback and do some other things to get the ball to Jaleel and those outside guys as well,” Griffin said. Defensively, Griffin said since the Spartans have been running the same system the last two years that he is encouraged by their progress. Even though Wallace will be the quarterback, Griffin said he is an even better defensive back and will be the mainstay in the defensive backfield. 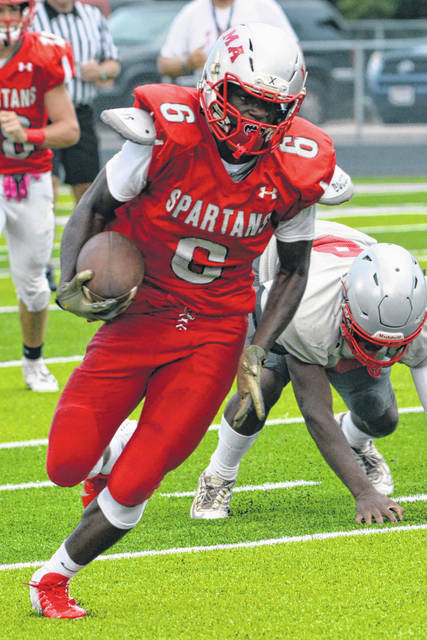 On the defensive line, Brandon Taylor, a second team, all-Three Rivers Athletic Conference pick as a sophomore anchors the Spartan front seven. Griffin said Taylor already has an early offer from South Florida. Last season Taylor recorded 46 tackles and four sacks. Joining Taylor up front will be senior Jordan McClendon which makes a strong one-two punch up front for the Spartans. Back at linebacker is DeWayne Cowan and Griffin expects the senior to have a big year. Griffin added that a lot of these players have gained valuable mentoring from past players who have moved on to play at the next level. However, Griffin stresses that they have to carve out their own style of play and personality. Griffin said his team faces one of the toughest schedules in the stat that includes early stops at Northmont as well as battling in the always tough TRAC. This entry was tagged High school football preview 2018, limasenior. Bookmark the permalink.